Lama Zopa Rinpoche in Mongolia, October 2010. Photo by Ven. Roger Kunsang. one has studied, to meditate, to achieve realizations; how much of our life we have had to bear hardships for this, suffering – what hardship we have gone through is nothing, it is unbelievable comfort compared to what Buddha did. What hardship we bore to spread the Dharma to sentient beings, for the center to spread Dharma to sentient beings, however hard we have worked, however much hardship we have born to spread Dharma to sentient beings is nothing compared to what the Buddha did. Understand this. It is most unimaginable how it is so beneficial – one example is FPMT. Since the centers started so many years ago, there were so many hardships at the beginning. Most times people came to Nepal and did a one-month course, blah, blah, blah. It benefited their heart, then they came back to their home, their country. The benefit they got, the happiness and inner peace, they wanted many other people in their country to get this happiness and peace, real freedom – freedom from oceans of samsaric sufferings, not just to heal a headache temporarily, to heal the stomach temporarily, to heal cancer temporarily, but to liberate them from oceans of samsaric sufferings by liberating them from the cause: karma and delusions. By liberating them from the seed of delusions, to cease that, then they can achieve ultimate happiness, everlasting happiness. Then you start a center. Usually the advice [to work in a center, project or service] is given by the guru. It is to fulfill the wishes of the guru, so therefore can you imagine every day, every hour, every minute, your service from obtaining the advice, and fulfilling the holy wishes? Every day, every hour, every minute, every second can you imagine the merit you collect? The most powerful karma, merit. It is the wisest way of collecting merit, the most skillful, because you are doing it in relation to the most powerful object, following the advice. Can you imagine? It is unbelievable. So you work so hard, sacrifice your life for soooo many years, for soooo many years bearing hardships in the center to spread Dharma for sentient beings to come, to learn meditation, to practice, for their mind to become Dharma, to achieve renunciation, bodhichitta, right view, to achieve liberation and enlightenment, to get out of samsara. Now remember what the Buddha did for sentient beings, how he sacrificed his life for three countless great eons for sentient beings and for you. If you remember that, for so many years you worked for sentient beings to spread the Dharma, it is nothing. Compared to that, it is nothing. The hardships you have gone through are nothing compared to what the Buddha did for you and for sentient beings. This is what I wanted to say, so rejoice. That understanding is very important, and then to rejoice. … I want here to thank everyone, many people who sacrificed their life for the center, for the organization, for many years. I want to thank on behalf of Lama Yeshe, on behalf of myself, on behalf of all buddhas, on behalf of all sentient beings. The organization has been developed. People have more and more education in Buddhism and the good heart. Good heart has been developed. Compassion is what makes it possible to achieve enlightenment, so overall compassion is more developed, compassion with Dharma wisdom, compassion developed with Dharma wisdom – that is the development that I see in the FPMT organization, more compassion. That is the most important one for enlightenment, most important one for the happiness of all sentient beings. Excerpted from the Light of the Path teachings by Lama Zopa Rinpoche, September 20, 2010. Read the full advice on Rinpoche’s Advice page, plus more advice regarding offering service in the FPMT. Lama Yeshe Wisdom Archive also keeps a collection of Rinpoche’s advice for centers, projects and services. Excerpted from Ven. Roger Kunsang’s blog Life on the Road with Lama Zopa Rinpoche (posted on October 20, 2010). Ven. Roger’s very entertaining blog enables us all to keep up with Rinpoche’s activities. The President of Mongolia presents The Order of the Polar Star to Lama Zopa Rinpoche. “Several months earlier the director, Khatanbaatar Choidogsuren, of the FPMT center in Ulaanbaatar, Mongolia – Shedrup Ling Center – on behalf of many of Rinpoche’s Mongolian students requested the Mongolian Government to consider Rinpoche for this prestigious award. Rinpoche met the President and first offered a large thangka of the 35 Buddhas to the President as well as special blessed pills. They had a discussion together and one of the things Rinpoche mentioned to the President was the importance of the Golden Light Sutra (Rinpoche offered a copy of our translation in Mongolian), and Rinpoche mentioned his promise to Chenrezig to spread this sutra all over Mongolia and the world. Over the past three weeks Friends of FPMT has campaigned to welcome 500 new participants to the program. We are very happy to announce that 300 new Friends responded to this appeal, 60% of our goal. THANK YOU to everyone: whether you became a Friend of FPMT, forwarded on our emails, or simply generated a kind thought for our work. Your support means so much! Living in the Path: The entire retreat event can be viewed on the FPMT Media Center. The first online module from the 2010 teachings will be available in December. In the meantime, you can find what materials are already available on the Online Learning Center. Simply click on “Light of the Path Retreat Materials, 2010.” Here you will find the root text in several languages, all of the audio and video files for download, a complete transcript of the teachings, and the video files of Ven. Steve Carlier’s review sessions. NOTE! In Living in the Path‘s second module, “Taking the Essence,” session four, a new video file has been added of Rinpoche leading the precept ceremony. Rinpoche has given permission to use this video in the place of a live preceptor for those who have never taken precepts before. Using this video, centers can now offer new students the opportunity to receive the Eight Mahayana Precepts directly from Rinpoche! If you have questions about how to host Living in the Path in your center, please write to Merry Colony directly. Basic Program: More Spanish materials were added including Manual for Chapter 4 of the Ornament of Clear Realizations and the root text for 70 Topics, major translation achievements by Ven. Nerea! Also, several Heart Sutra and Tathagata Essence course materials are available due to the untiring efforts of MP student Ven. Teresa Vega (Lobsang Drolma). Kushi Ling, Italy, started the Basic Program with about 20 students taught by their new resident teacher, Geshe Dondub. Two new BP graduates, Ven. Chokyi and Janet Hintermann, received their completion certificates at Tse Chen Ling, California, from the hands of Geshe Dakpa who has been teaching the BP over many years with great dedication. O.Sel.Ling had a “totally beautiful” one-month retreat this August with Ven. Dondub. There were between 20 and 30 participants, including a group of 18 BP students from Barcelona. Every year, O.Sel.Ling will offer all BP students, from Europe and beyond, this opportunity to complete part of their three-month retreat requirement. NEW! Education Services is making many of the large practice books available in e-book format (for iPad and Kindle). Currently available are Essential Buddhist Prayers Vol. 1 & Vol. 2, FPMT Retreat Prayer Book, Lama Tsongkhapa Guru Yoga, Bodhisattva Vows, Heart Practices for Death and Dying, Extensive Offering Practice, and Medicine Buddha: The Wish-Fulfilling Jewel. NEW! Over the course of the next six months, we will be making all our MP3 recordings available in a downloadable format at half the price of the hard copies. 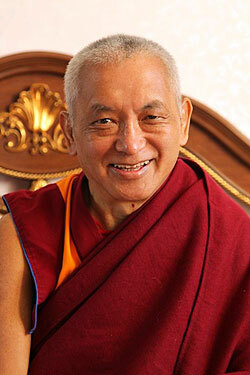 Currently available are Lama Zopa Rinpoche’s recitation of the Sanghata Sutra and Singing the Lam-rim. By November 2, we’ll also make available Rinpoche’s chanting of the Praises to the 21 Taras and the Vajra Cutter Sutra, as well as the popular Meditations for Children. Recharge your iPods! NEW PDF! Chanting the Names of Manjushri. Back In Print! Intermediate Practices of Vajrayogini. Thirty-eight people just attended a very successful Foundation Training at Serlingpa Retreat Center in Mexico with Amy Cayton and Merry Colony. 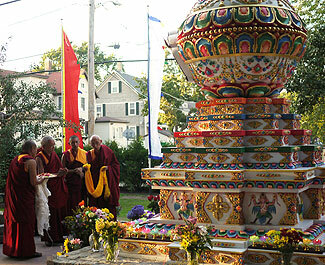 FPMT Education Services has recently given birth to a new branch: FPMT Translation Services. This office is responsible for organizing a team of FPMT teachers, translators, interpreters and editors who will collaborate to standardize terminology for FPMT translations from Tibetan into English. 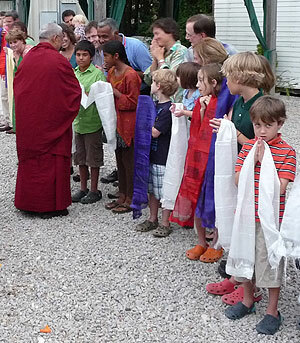 Lama Zopa Rinpoche has given this team the name Lotsawa Rinchen Zangpo Translation Team (LRZTT). FPMT Translation Services invites all FPMT translators and interpreters of Tibetan into English, as well as editors of translations, to apply to join this team. The first meeting of this team will be held at Istituto Lama Tzong Khapa, Pomaia, Italy, May 13-20, 2011. More information coming soon! In October, some 3,400 monks from Ganden Shartse and Jangtse Monastery in India offered a special puja one week before Lha Bab Duchen requesting Buddha to descend from Tushita. In November, all the monks of Ganden Monastery in India will be offering tsog on the anniversary of the passing away of Trijang Rinpoche. 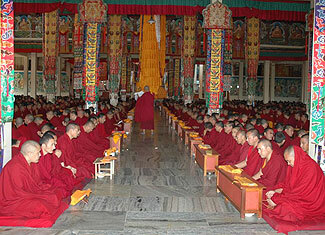 On Lama Tsongkhapa Day (November 30, 2010), Ganden Monastery will offer 10,000 Indian rupees for light offerings. Thank you to everyone who supports the FPMT Puja Fund, such an amazing and simple way to create so much merit for the FPMT and one’s own activities. Please contact the LRZTP director, Tim Van der Haegen, if you need an interpreter for your center, project or service – there may be a qualified interpreter waiting for you. Please plan NOW in case you need an interpreter in 2013! Contact Tim if the next LRZTP program could train an interpreter for your center, project or service. In the FPMT Affiliates Area, you can watch Rinpoche teaching “How to Rejoice About Hardships Born While Working for the Center” while reading the edited transcript! You’ll also find Rinpoche speaking on the topic of becoming a center director. Six students are going to use their Tibetan interpreting skills to help FPMT centers: Ven. Dechen (Shakyamuni Center, Taiwan, where she will start a new LRZTP program); Ven. Khedup (Nalanda Monastery, France); Rosario Verra (Istituto Lama Tzong Khapa, Italy), Beatrice Guibert (Chokyi Gyaltsen Center, Malaysia) and Sangmo (Chandrakirti Centre, New Zealand). There are four remaining students who we are working to place in an FPMT center as soon as possible. All students will formally graduate from the LRZTP once they complete the second part of the program: working as an interpreter in an FPMT center for two years. Please contact Tim with questions about the next program, LRZTP 6, planned to begin in October 2011. 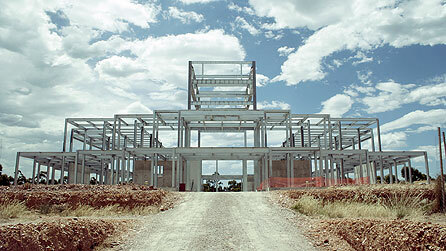 The top of those enormous galvanized steel trusses is almost 20 meters (65 feet) above the ground. This is about 40% of the total height of the Great Stupa. Our strategy is to go no higher for some years. Rather, we will complete the bottom half of the Great Stupa so that it is at “lock-up” stage. Our target is to have this as finished as possible by April next year when Rinpoche will lead a month-long Australian retreat inside the Great Stupa (April 2 – 30). Within a few weeks, we will spend AUS$1 million on concrete shear walls and ceilings. Later this year, we will spend just over half a million on extensive steel framework throughout the bottom half of the Great Stupa. And early next year, we will spend a further million on more concrete, including a massive suspended concrete floor across the steel trusses that you see in the photo. Buddha Amitabha Pure Land in Washington State, USA is looking for a director to develop the retreat facility.